Alhambra and Albayzin are good opportunities to explore the local culture. You'll explore and learn at Reez and Milenium Gallery. Change things up with these side-trips from Granada: Nerja (Fundación Cueva de Nerja, Jardin Botanico Detunda Cueva De Nerja, & more). Spend a day outdoors on the 13th (Wed) with Sierra & Sol. The adventure continues: appreciate the extensive heritage of Mirador de San Nicolas, admire the striking features of Generalife, get a dose of the wild on a nature and wildlife tour, and hike along Llano de la Perdiz. 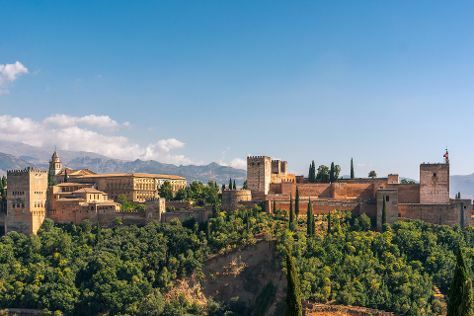 Plan a Granada trip in moments using our itinerary builder. Malaga to Granada is an approximately 1.5-hour car ride. You can also take a bus; or take a train. Traveling from Malaga in February, expect Granada to be little chillier, temps between 14°C and 3°C. 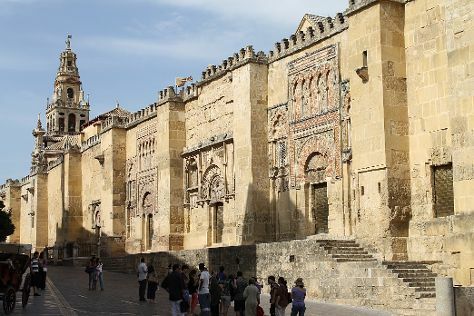 Finish up your sightseeing early on the 15th (Fri) so you can go by car to Cordoba. Kick off your visit on the 16th (Sat): view the masterpieces at Sala el Potro, get to know the fascinating history of Calleja del Panuelo, then contemplate the long history of Mezquita Cathedral de Cordoba, then get to know the fascinating history of Jewish Quarter (Juderia), and finally steep yourself in history at Alcazar de los Reyes Cristianos. Get ready for a full day of sightseeing on the next day: hunt for treasures at Mercado Victoria, trot along with a tour on horseback, then take in the views from Roman Bridge, and finally stop by Tienda Gourmet Casa Pedro. To find where to stay, ratings, photos, and other tourist information, use the Cordoba trip planner . Traveling by car from Granada to Cordoba takes 2.5 hours. Alternatively, you can take a train; or take a bus. Traveling from Granada in February, expect nights in Cordoba to be about the same, around 5°C, while days are a bit warmer, around 19°C. Wrap up your sightseeing on the 17th (Sun) to allow time to take a train to Seville. Satisfy your inner culture vulture at Barrio Santa Cruz and Seville Cathedral. For shopping fun, head to Un Gato en Bicicleta or Antiguedades el Museo. There's much more to do: admire the landmark architecture of Plaza de Espana, wander the streets of Centro Historico de Sevilla, head outdoors with Estadio Ramon Sanchez Pizjuan, and explore the galleries of Royal Alcázar of Seville. To see reviews, ratings, and tourist information, use the Seville online trip planner . Take a train from Cordoba to Seville in an hour. Alternatively, you can drive; or take a bus. In February, daily temperatures in Seville can reach 18°C, while at night they dip to 8°C. Wrap up your sightseeing on the 23rd (Sat) to allow time to drive to Cadiz. Cádiz is a city and port in southwestern Spain. On the 24th (Sun), enjoy the sand and surf at Los Corrales de Rota, then hike along Pasarela del Litoral de Rota, then take in the exciting artwork at Baluarte de la Candelaria, and finally identify plant and animal life at Parque Natural Las Brenas. For where to stay, photos, reviews, and tourist information, go to the Cadiz trip itinerary maker tool . Drive from Seville to Cadiz in 1.5 hours. Alternatively, you can take a train; or take a bus. Expect a daytime high around 18°C in February, and nighttime lows around 9°C. Cap off your sightseeing on the 24th (Sun) early enough to go by car to Ronda. Shop till you drop at Bodegas Cortijo Morosanto and Scott Simpson Fine Art. Get in touch with nature at SierrAventura Ronda and Riding Fun In The Sun. And it doesn't end there: take in breathtaking views at El Tajo de Ronda, learn about winemaking at Joaquin Fernandez Bodega, get interesting insight from La Ciudad, and tour the pleasant surroundings at Reservatauro Ronda. To see ratings, reviews, maps, and more tourist information, use the Ronda trip itinerary builder . Drive from Cadiz to Ronda in 2 hours. Alternatively, you can take a bus; or do a combination of train and bus. Traveling from Cadiz in February, plan for little chillier nights in Ronda, with lows around 6°C. Wrap up your sightseeing on the 3rd (Sun) early enough to drive to Malaga. Visit Alcazaba and Ermita de Nuestra Senora de los Remedios for their historical value. Give yourself a bit of retail therapy at Galeria Martin & Reich and Mahatma Showroom. You'll find plenty of places to visit near Malaga: El Torcal Natural Park (in Antequera), Nerja (Capistrano Playa, Paseo de los Carabineros, & more) and Adventure Rider Centre (in Mijas Pueblo). There's much more to do: get a taste of the local shopping with Art Gallery Gravura, view the masterpieces at Benalmadena Exhibition Centre (Centro de Exposiciones de Benalmadena), explore the landscape on two wheels at Bikestardo, and explore the world behind art at Benedito. For reviews, traveler tips, other places to visit, and more tourist information, read Malaga trip planner. Drive from Ronda to Malaga in 1.5 hours. Alternatively, you can take a bus; or take a train. In March, daytime highs in Malaga are 23°C, while nighttime lows are 11°C. Wrap up your sightseeing by early afternoon on the 10th (Sun) to allow enough time to travel back home.